Pirate Prerogative: Have You Seen The Ship Shop? Have You Seen The Ship Shop? You may have noticed a new tab at the top of this page, the one that says "The Ship Shop?" If you didn't, or even if you did, you may be wondering what it is. That's exactly what I'm writing this. It's items The First Mate, The Captain, and I think are great, we use, and we couldn't live without. There are also a few items that our on my wish list. In other words, I love them, but I haven't convinced myself to spend the money and something for just myself yet. I've also created different shop categories to make shopping easier. 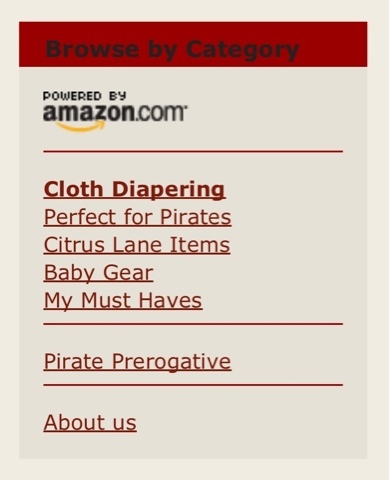 Cloth Diapering- Items we love for cloth diapering. I could go on forever in this category, so expect new items often. Perfect for Pirates- This is a collection of items that would be great for the little Pirate in your life. We own a lot of these, but there are many that are wish list items. I think this will also be a frequently updated category. Citrus Lane Items- I have grouped all the items we've received from Citrus Lane so far into one easy to shop category. This will change mid-month each time we receive out Citrus Lane box. Baby Gear- Some of the items that made life with a baby so much easier! Our stroller and car seat for example. My Must Haves- Here is where you'll find both my personal wish list items and my absolute must haves! 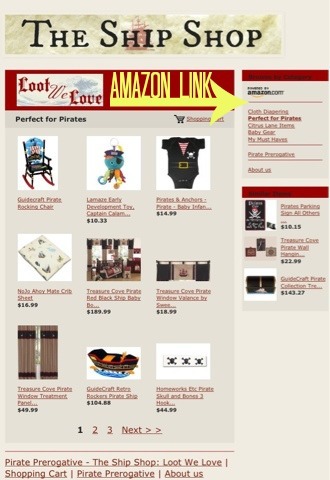 I created The Ship Shop through the A-Store feature available for Amazon affiliates. In case you didn't know, I am an Amazon affiliate. That means I get a small percentage of any purchase made through an Amazon link on my site. That money goes to support Pirate Prerogative and keep it growing, so thanks. If you like anything you see in my A-Store, feel free to add it to your shopping cart. If you don't see anything that suits you, or you'd like to keep shopping on the Amazon that you're used to, just click on any Amazon link on my site. There is one in the sidebar to the right and also one on the top right corner of The Ship Shop. It can't be said enough, I am so grateful for your support!